Lenovo has been showing an immense growth and improvement in the recent times, and the Vibe series from the company has shown some class. Earlier, it was the Vibe Z2 Pro and now, the recent launch from Lenovo, the Vibe X2 has its own layered design, but the company hasn’t limited it to the design as the USP. There is a lot more to it than just those layers. But, the smartphone has a chipset from Mediatek and it is the Vibe UI which many might not have used earlier. Is the Vibe X2 worth the hype and worth the price? Definitely, the “layers” concept isn’t a bad attempt from Lenovo, and that is because it isn’t limited to those layers that are visible on the side of the device. There are additional layers as accessories, and these enhance the functionality of the Vibe X2. For example, the two layers we were introduced to – one is an extra battery layer, and other is a speaker layer which enhances the audio output from the smartphone. The smartphones in the current age are either unibody or come with a removable back cover. Nothing different or special in any of them, except for the material used to make them. Lenovo scores a double win here, firstly with the layered concept which looks ultra cool, and secondly with magnesium alloy used to make the body. It isn’t plastic, but it is still lighter than many plastic phones of similar size. For once, you surely would feel this was made of polycarbonate, but the smooth and good-to-feel back of the phone makes you wonder whether it really is made of the common material. The back is slippery, but the sharp edges keep it held firmly in the palm. Just 120 grams. And those multiple layers add up and still keep the Vibe X2 at a sleek 7.3mm. The only problem with the design is its soft edges, which could dig in and feel uncomfortable while holding the phone for a long time. This is still a packed design, for those who were wondering whether the back cover can be removed. You won’t be able to pull out any layer, and the slot for SIM card is on the left side panel, where you have to pull out the SIM tray (having a MicroSIM and a NanoSIM slot). The physical buttons (power, volume rocker) are on the right panel and well placed to adjust with one of the layers. There are two microphones, one in the bottom and one beside the rear 13-megapixel camera and LED flash. It’s good how Lenovo has managed to keep the device compact for the 5-inch display, as not much space is wasted around the display, and bezels as well are thin. Below the display, there are three navigation keys which lit up and stay on until the screen is active. Above it, are a set of sensors, a camera and the earpiece. Overall, a very refreshing and good looking design this, for the Lenovo Vibe X2, and this seems one of a kind. Although it feels light and sometimes very delicate, it is rigid enough and you get that feel when the device is in the hand. Pictures sometimes say a different story. The display on Lenovo Vibe X2 uses the IPS technology, and it is a Full HD resolution one, with 1920×1080 pixels. The color reproduction is all good, and the viewing angles are decent if not great. You would easily find the reflection from the other side when viewing on the display from a side angle, and that is due to the not-so-bright display. The brightness levels are not really great, and under the sunlight, readability is not really great. At least when comparing with some flagships, this is better than the Xiaomi’s Mi3 but at the same time, the Moto X could beat it clearly with the readability under bright sunlight. But for the price, there are no better displays than this when it comes to color reproduction and quality. The display is protected by Gorilla Glass 3 screen. The actual quality is judged when we play some high graphic content in the device, and the colors were bright and vivid in the Vibe X2. 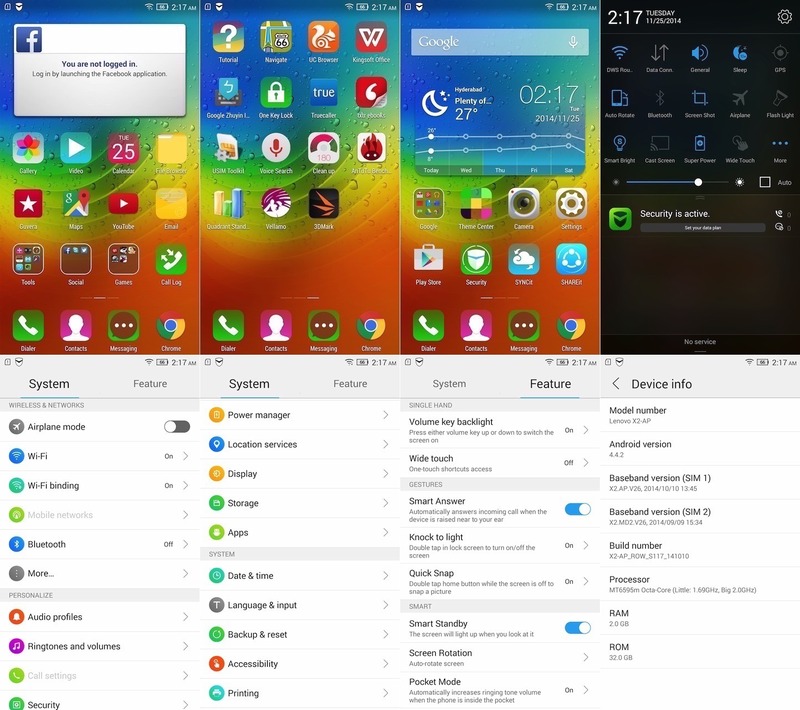 Vibe UI is what Lenovo has layered with customized options, over the Android 4.4.2 KitKat OS. The absence of app drawer could be an issue for few who have always been seeing them on stock UI or the ones from Samsung, LG and such, but Lenovo hasn’t limited the UI with the home screens having just the app icons. The user can still place widgets, shortcuts and such. It is just a few days for someone to get used to this UI, and then it is no way going to eat your brain, as how much ever confusing it might look initially, the interface is easy to use and navigate through. On the lock screen, tapping on the center time bubble spreads out the other bubbles, each one having a shortcut to different frequently used apps. Not one of those which you wanted to open? swiping in the empty space unlocks the screen. With customized UI, comes the unnecessary bloatware (with some exceptions), including apps such as UC Browser, Kingsoft Office, One key lock, Truecaller, Clean up, Navigate, Gamestore, CLONEit, Security, SYNCit, SHAREit and the Google Play apps. Some nifty features add to the user experience, for example, double tapping home button when screen is inactive, so that it activates the camera and quickly take a picture. The notification panel comes with the top section for quick settings, which when pulled down opens up more than 5 quick settings in the top bar that are always visible. Another neat gesture feature is call activation when you raise the phone near to your ear. The Theme Center has options to change themes, wallpapers, sounds and lock screen layout as the main ones apart from boot animation, system UI, Notification UI and call page layout. Overall the UI is pretty interesting, and not everyone might get acquainted to it on the very first day, but later on, you will feel this to be very easy and open with options not deeply hidden. 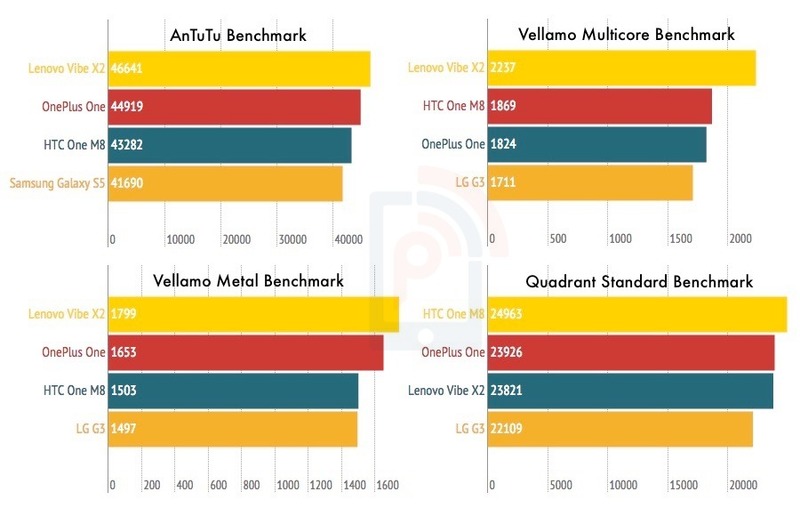 Lenovo had mentioned that the Vibe X2 has the top scores in benchmark tests, and the Mediatek MT6595m True octa-core processor does back that statement, with AnTuTu score topping over 46000. Such were the results on other benchmarks as well, though the scores aren’t the deciding factors to judge the performance. The smartphone was the swiftest of all Mediatek-powered smartphones we have ever used. It never fret in loading several tabs, opening graphical websites in Google Chrome, multitasking was perfect and even while running 8 apps at a time (2 games in background), about 221MB RAM was still free. We played Asphalt 8, Real Football 2014, Spider Man: Ultimate and FIFA 15, each of them having heavy graphics. And to check the battery as well, we played each game for about 20 minutes, in a loop. The phone couldn’t stay up and play the game for more than 2 hours. Quite understandable that, given we are playing high-end graphics on a full HD display with maximum brightness. But for the performance, the Vibe X2 never broke a sweat. This looks like a very properly optimized UI which doesn’t give up on regular usage, making calls, switching between apps and taking quick pictures. That is how we normally use a smartphone, and expect it to be smart enough to take all the load without freezing. The Vibe X2 has a 2300 mAh battery, which is not the best in giving you a full days’ usage, unless you optimize it to reduce the juice drain. The display drains the battery quickly, though in lesser brightness it gets better. There was dramatic battery drain in 3G connectivity, while video playing on Wi-Fi was easy on the battery. The Power Manager has some nifty options to extend battery life, i.e. with Ultra Power Saving Mode (which restricts the UI to calls and messaging. The other battery saving features include Screen and GPU power saver. 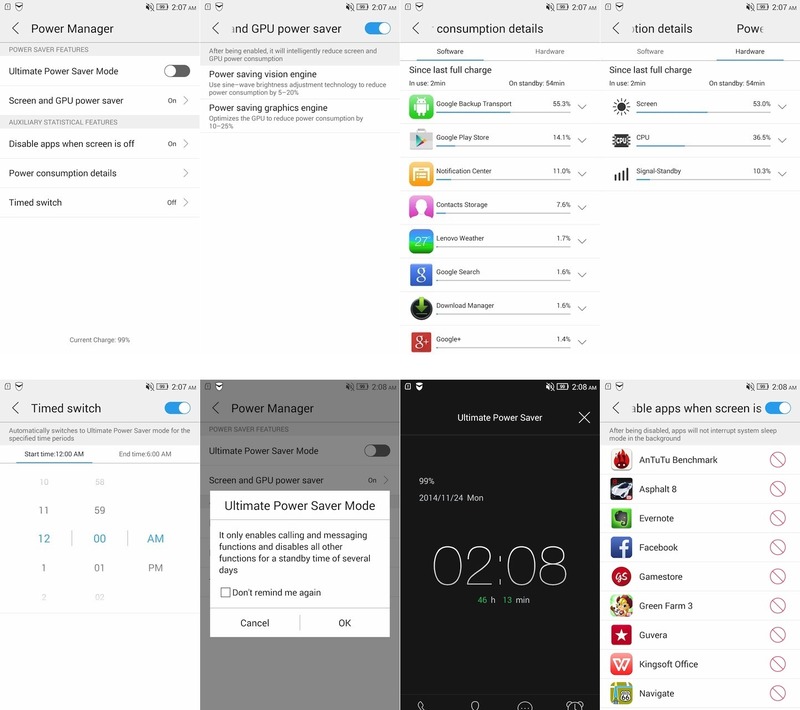 The user can also choose to disable apps when the screen is turned off, and there is a timed switch which automatically turns the power saving mode on at particular time intervals. The camera is good, but not great and far from best for a 13-megapixel shooter. The captures don’t look the perfect under any kind of artificial lighting, and the final picture looks grainy. The color reproduction was great and the captures in natural light came out pretty well. But the low light captures weren’t as expected, and we can compare this with the quality of the Moto X 2nd gen captures for low light pictures. In fact, the Xiaomi Redmi 1s and Asus Zenfone 5, both do a better job in low light capturing. The capture speed and focusing is quick, and there are settings where you can try and change the saturation and contrast levels, if the image quality is not satisfactory. There is HDR mode, and the settings in the camera app include options for aspect ratio, white balance, scene modes, ISO, grid lines and a single button to set options to default ones. Video can be recorded to a maximum of 1080p Full HD resolution, and the focusing can be set to continuous or infinite, and there is a toggle for video stabilizer. There is nothing much in modes except for the few effects and panorama. The effects won’t do much good, except for ones who don’t want an extra app as Instagram and wanted such effects to share on social networks. On natural colors, i.e. flowers and leaves, the colors are over-saturated and that is very clear in the pictures. The HDR mode takes a couple of seconds and asks you to keep the device stable while the picture is being taken, and in landscape, there is little difference one can notice between the normal and HDR captures. The front-facing 5 megapixel camera is good, but the subject looks very much flattened, overly done. But the colors were well retained, and the quality is appreciable enough. Overall, the camera is what you would expect for the money and the video recording of 1080p resolution too is decent but a little shaky. The absence of MicroSD card slot should not be a deal breaker, because around 24GB free space is available from 32GB internal storage. Touch response is great. The displays attracts fingerprints, but overall the display is great. The Dual SIM tray can have one MicroSIM and one Nano SIM in the same tray, that has to be pulled out using a SIM ejector pin. The Wi-Fi binding is a very handy feature for those who wanted to save data network, and want the phone to automatically look for Wi-Fi networks around based on the location. There is no NFC, while the available connectivity options such, i.e. Wi-Fi, Bluetooth, 3G were all good, without any issues. The speakers on the back don’t have a great output but the audio is crisp and clear. Sensors are useful (very responsive for Auto brightness controls) and there is a good “pocket-dial prevention mode, which prevents unnecessary touch of the screen, and that is recognized by the sensors. To end it in a quick way – The Lenovo Vibe X2 is simply one of the best devices products for its price. Everything is good in the device, right from the design. There are flaws where one might find them as a deal breaker, especially the battery. But if you are someone who isn’t traveling much, and is obsessed with designs and happy with a customized UI, Vibe X2 is a perfect one. As we suggest always, the alternatives in this price are the Moto X (1st gen), which might not hold the same strength though (10MP camera, 720p display), HTC Desire 816, Huawei Honor 6 and HTC Desire 820Q. But seriously, the X2 performs great, has a bright and good display and the UI is interesting with some intuitive options. What is more important, here is the layered accessories. The battery layer, speaker layer do add to the user experience and these are unique, not changing much in terms of design. Lenovo’s pulled off a good one with the Vibe X2, and for those looking at Mediatek processor as a deal breaker, you are in for a surprise here.